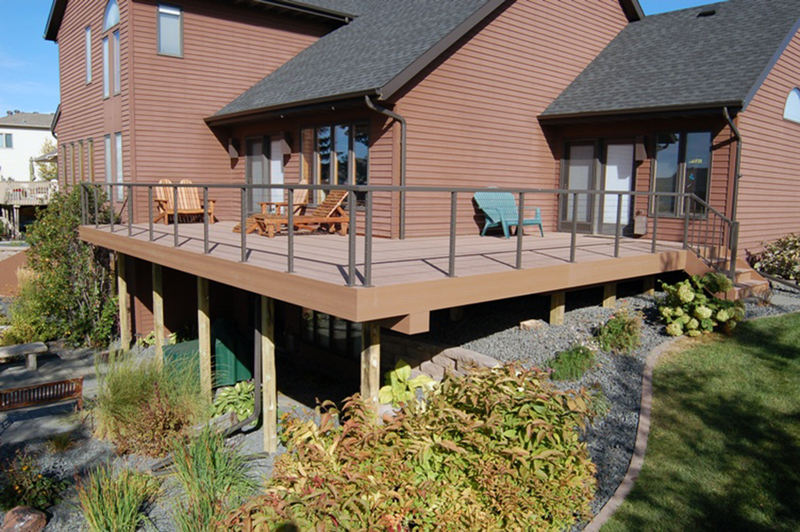 December 19, 2011 – Wilmington, OH | ProBuild, the nation’s largest supplier of building materials, has named TimberTech as a preferred national provider of decking and railing materials. This arrangement strengthens an already long-standing relationship between these two companies and ensures that TimberTech products would be available to all of ProBuild’s distribution centers in 45 states. “Our partnership with ProBuild has enabled us to reach industry professionals for a number of years. This enhances the commitment from both parties and will continue to drive TimberTech’s market share gains,” states Craig Hyatt, national sales manager for TimberTech. TimberTech offers the widest selection of outdoor living solutions with an extensive array of decking, railing, fencing, low-voltage lighting and under deck storage products. ProBuild has been serving the needs of national builders, local contractors and do-it-yourselfers and has quickly grown by offering the advantages of national reach with the reassurance of local expertise. “While innovation has been vital to TimberTech’s success as a leader in the decking and railing categories, it is our partnerships with strong distributors that have made TimberTech a leader in the categories we serve, through increased reach of TimberTech products and brand awareness of the TimberTech name,” explained Stu Kemper, CEO of TimberTech. 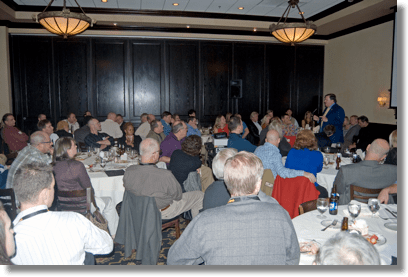 December 11, 2011 – Atlanta, GA | I sincerely hope all of you enjoyed our event at Maggianos on 12/8/11 as much as I did. We had a total of 85 industry pros in attendance! I thought the food and atmosphere were great and the guest and company that shared the room even better. Thanks so much to Great Southern Wood Preserving, Timbertech, and Fortress Railing, for their generosity in sponsoring this event. They all stepped up to the plate in a big way for this one to make it possible to celebrate our year -end event as we did. Thanks to Maggianos for providing us Five Star service as well. I hope all involved realize how fortunate we were to have Mr. Jimmy Rane, the founder and CEO of Great Southern Wood Preserving take the time to attend our event and serve as our keynote speaker. The story of his and Great Southern’s history are not only extremely interesting but also very inspiring. Success stories of this magnitude are rare and to be in the presence of someone who has started from scratch and taken a business and industry to such a level was a true privilege. His manner of speaking and the humbleness he demonstrates is impressive, admirable, and refreshing. I hope Mr. Rane knows just how much we appreciate him spending the evening with us. 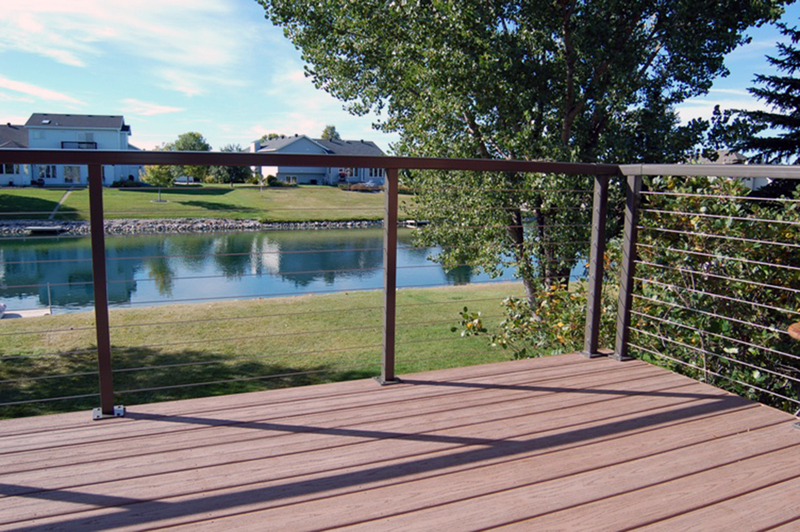 November 30, 2011 | Durarail, the powder-coated aluminum railing specialist, now offers Cable Railing – a contemporary deck railing system that provides minimal view obstruction with maximum style. 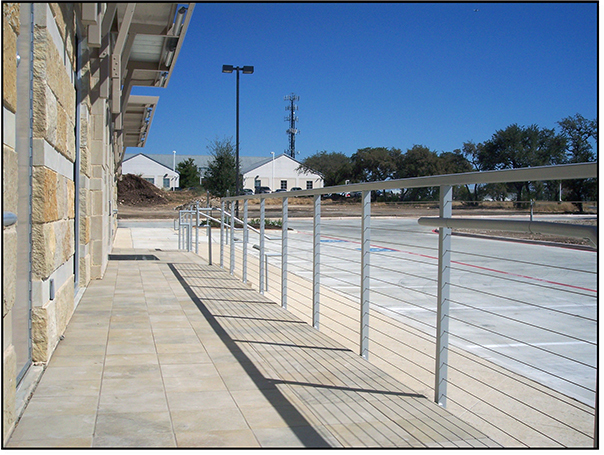 The stainless steel cables allow airflow through the deck and provide excellent resistance to the elements for an attractive, low maintenance railing solution. Durarail’s powder-coated aluminum top rails and posts provide the ultimate framework for the new Cable Railing System. Cleverly designed cable fasteners are hidden within the posts, allowing you to attractively frame the perimeter of your deck with a sleek, clean and modern look that can stand up to the elements and provide many years of functional and esthetic appeal. With a choice of 5 standard Durarail Top Rail designs, homeowners can choose the look that most appeals to them. Available in 8 standard colors and 180 custom colors, Durarail framework is UV resistant and will not peel, flake or blister as it ages so there is no need for sanding, staining or painting. In addition to it’s esthetic appeal and durability, Durarail’s Cable Railing System has another advantage; Its stainless steel cables contain at least 65% recycled content which help qualify for LEED credits. Please feel free to contact Jennifer, toll free at 866.591.5594, if you have any questions or require additional images. Screw Products, Inc. wanted to make our Power of One Pledge in conjunction with our current growing business plans. We pledge to support safe deck construction by supporting the very source that drives it. NADRA, You and Our industry together, United as One. Along with the below, we make our NADRA family a special offer. Your name will appear with a special NADRA logo that links back to www.nadra.org, setting you above all the rest as a proud member! Hopefully by wearing the NADRA badge more learn about NADRA and join our teams to promote deck safety, build Decks for Soldiers and more! In addition to this, Screw Products, Inc. also pledges to put the NADRA logo on all of our advertisements, website and has offered them a space for deck safety updates in our monthly newsletters all pointing to www.nadra.org. It’s important for the public to be driven to quality builders who believe in quality products. To have your name, contact info & website listed on our site, please send information & a testimonial of using our Screw Products, Inc. brand to info@screw-products.com. To see examples of our current testimonials please visit, http://screw-products.com/testimonial.htm. Win a free logo & featured builder space! October 25, 2011 | Thanks to everyone that attended last Thursdays Atlanta NADRA Chapter meeting. Special thanks to Greg Mizerack and PMC Building Supply for sponsoring this event. PMC has been a good supporter of our chapter and this was their second sponsorship in the past two years. Greg gave a nice presentation regarding PMC Building Supply’s services and brought along an associate who made a presentation on Feeney Cable Rail. Special thanks go to Officer Hudson from the Georgia Public Safety Department who served as our guest speaker. His discussion and insight regarding legalities involved in operating commercial vehicles and the requirements pertaining to such was very interesting and helpful. Officer Hudson handled quite the influx of questions from our members and always had the answers. We really appreciate him taking the time to be with us. Thanks to Ginny Tibbetts for making the arrangements for Officer Hudson to attend. Chapter business included the final discussions regarding our upcoming Deck for a Soldier effort. Keith Compton led the discussion on this and has since met with the homeowner and finalized our efforts with Operation Homefront. Several of our chapter members who placed in the National Deck Design Awards were mentioned and recognized. One of the most important events of the night included our BOD offices elections. Both president and vice president seats were in play. This chapter is fortunate to have two members with such ability, commitment, enthusiasm, and class as James Gunning and Keith Compton who were the two names submitted as nominees. Both took the floor for a few minutes each to partake in our version of the Presidential Debates. Each shared their thoughts and reasons for wanting to be involved in the leadership of this chapter. October 24, 2011 – Richardson, TX | Leading iron railing and fence manufacturer Fortress Iron announced today that it has a new name, The Fortress Company. The rebranding reflects the company’s strong growth, as well as broadened product offerings in the residential and commercial building and remodeling markets. The Fortress Company is composed of three distinct business units: Divisions Fortress Railing Products and Fortress Fence Products as well as associate company, OZCO Building Products. As part of the rebranding efforts, the company’s website address changes from FortressIron.com to TheFortressCompany.com, which includes new brand identities and websites for Fortress Railing Products (FortressRailing.com) and Fortress Fence Products (FortressFence.com) that are specifically tailored to each individual market to help consumers quickly find their desired product. A link has also been added for OZCO Building Products (ozcobp.com), an associate company of The Fortress Company. September 14, 2011 | Thanks to everyone that attended [our last] meeting and helped with making it a success. The turn out was great with 52 signing the registry. The McCormick & Schmick facility was a definite step in the right direction although it’s obvious we still need more space. Our chapter apparently made an impression on the staff there as well as the manager has offered to set up a private bar for us at our next meeting since our members just about ran the legs off the servers… lol. Special thanks go out to Larry Pease and Kevin Magers of Trex for sponsoring our gathering. Larry gave an update on many of Trex’s new products including the porch boards and steel structure components. The presentation and the support and sponsoring of our chapter are much appreciated and it should be pointed out that Trex has strongly supported this chapter since our inception. Very special thanks to our State Representative Mark Hamilton who was generous enough to spend an evening with us and serve as our key note speaker. He touched on a number of interesting topics including issues that affect our state economically and on the immigrations legislation that is being passed in Georgia. Thanks to Ms. Ginny Tibbett’s for arranging for Mr. Hamilton’s appearance. Thanks to one of our founding members Frank Palogruto for giving a presentation on “Synergies”. This type of member participation is both appreciated and encouraged. I hope this is the first of many that will volunteer to share thoughts and ideas with our chapter members.